It is with much excitement that I join this year’s Home for the Holidays blog tour sponsored by Sondra Lyn at Home! This is the 3rd year for her HFTH tour, and we promise to bring some of the most awesome decor, craft and recipe ideas you’ll find anywhere. It has gotten bigger and better each year and I think you’re going to love what you see! So stay tuned – it’s 30 blogs over the week, with a different topic each day. Be sure you come back here every day to get the links for that day’s featured blogs! LInks to everyone’s post can be found at the bottom. If you’re new here, welcome to Worthing Court! 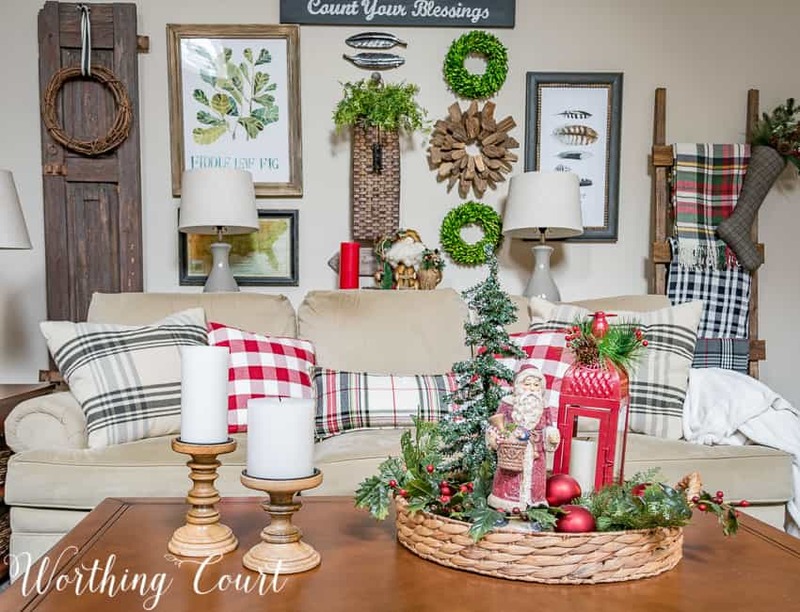 Let me show you around our farmhouse style Christmas family room. It’s my happy place right about now. 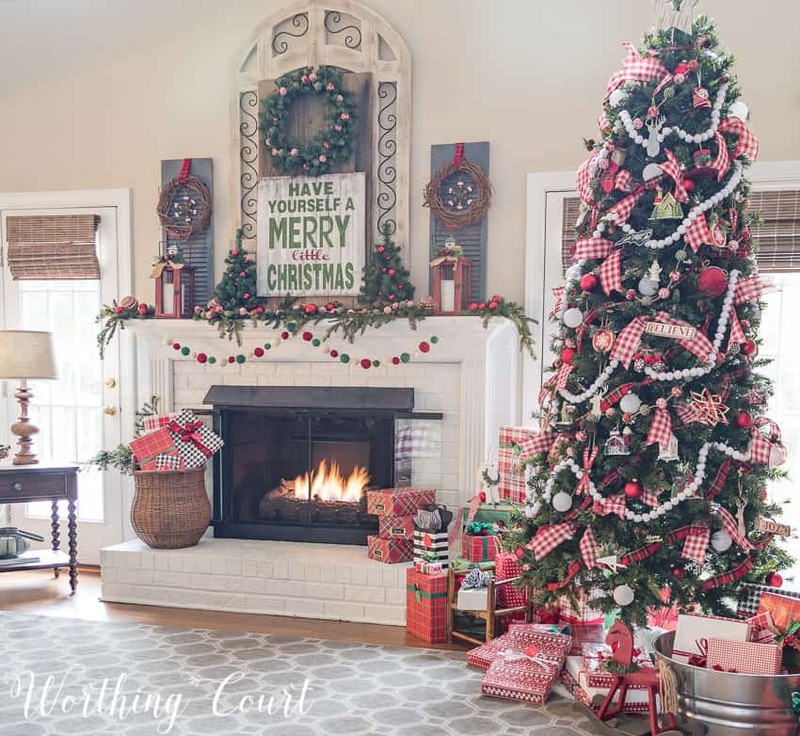 Over the years, I’ve used traditional Christmas decorations, whimsical decorations and neutral decorations in my family room. Those were all well and good and I loved them at the time, but this year, I’ve returned to my Christmas roots! 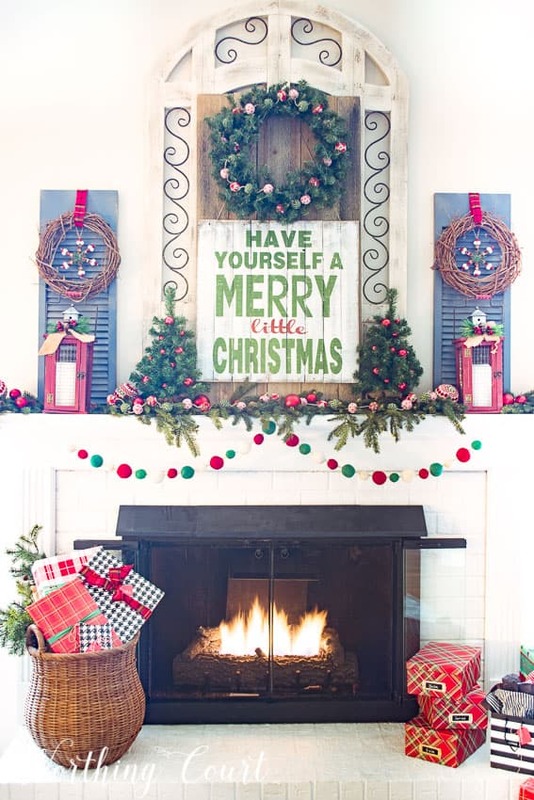 My Christmas “roots” lie in traditional red and green – but in an updated farmhouse’ish way. Like many of you, I grew up with red and green at Christmas, so my decor this year makes me feel all cozy and fuzzy inside! 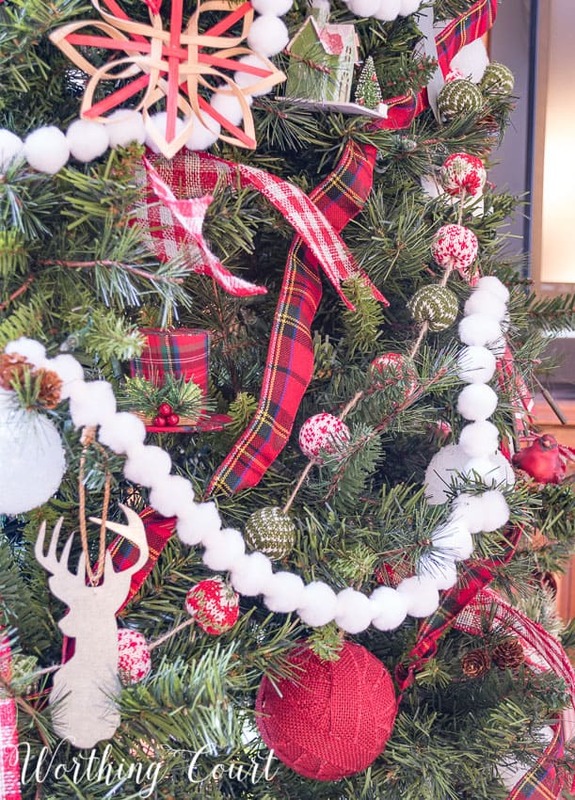 My tree is loaded with a variety of ornaments, tartan plaid ribbon, checked ribbon, a white pompom garland and a Nordic sweater garland that I fell in love with (from Kirkland’s). I’ve wrapped all of the gifts in a fun variety of patterns of red and green Christmas wrapping paper with a touch of black thrown in for good measure. I love to surprise people by displaying my gifts in unexpected ways! This year, not only will you find gifts under the tree, they’re also in a basket on the hearth and a galvanized metal tub by the tree. And see those plaid boxes stacked on the hearth? They’re actually photograph boxes that are already wrapped with plaid paper! Our couch is directly across the room from the fireplace. 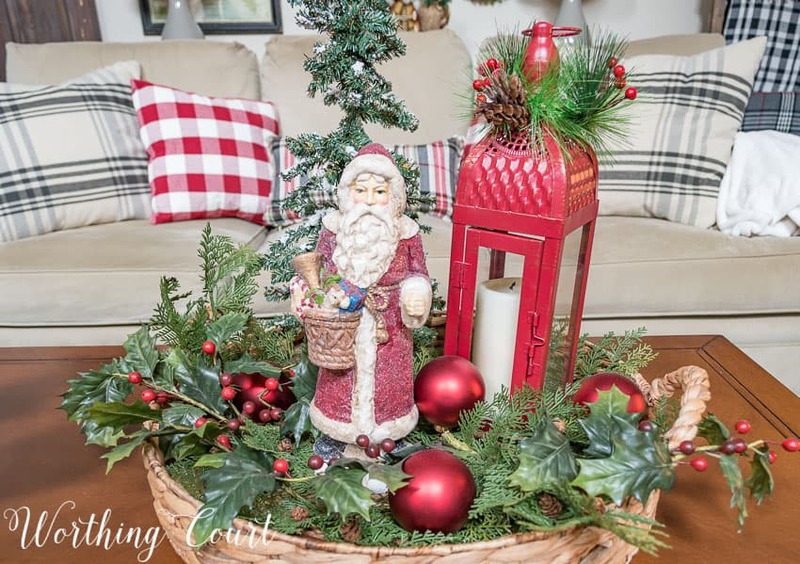 I only needed to add a few Christmas touches to this side of the room – a few Christmas pillows on the sofa and a Santa Claus and lantern display on the coffee table. 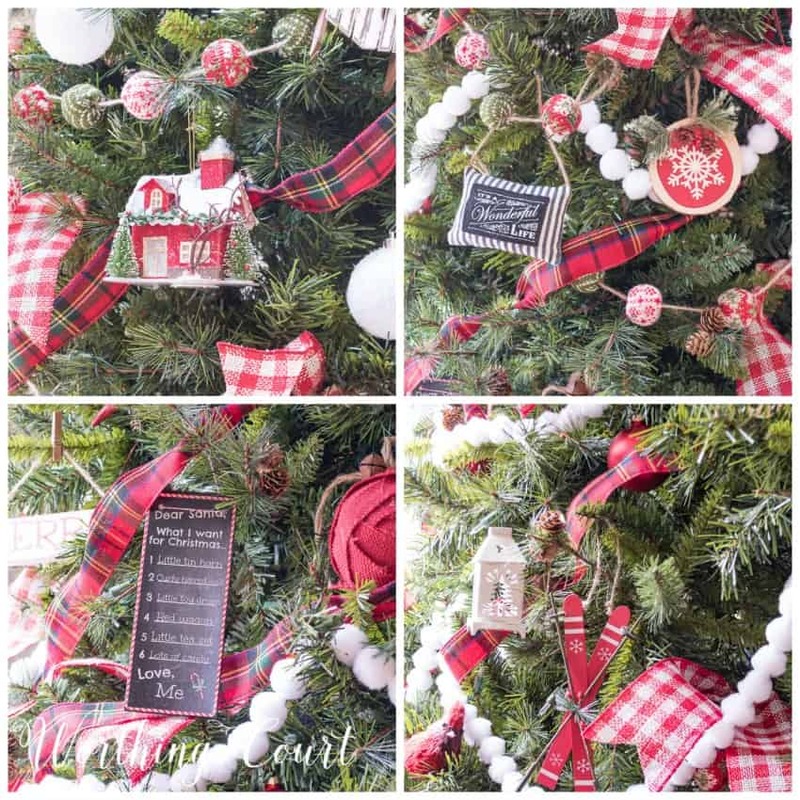 And my DIY rustic ladder got dressed up with Christmas throws in a variety of plaid patterns, topped off with a stocking filled with faux greenery and red berries. Did you know that I made that ladder? And that it was super easy and cost under $20? You can find the directions for how to make one HERE. Thank you for stopping by. I hope you have yourself a Merry Little Christmas! Be sure to visit the rest of the blogs for their wonderful Christmas decorations and recipes. I am going to have to make myself a ladder. Your home looks so inviting & wonderful. Keep the wonderful ideas coming. Loving the classic red and green! It does remind me of my childhood. Looks great! Oh I love a traditional red and green Christmas. This is stunning. Your room looks amazing. Thank you so much, Suzy, for going with traditional red & green! I really like the addition of color …. it is so boring to visit these “farmhouse” or “French country” blogs and see the same thing over & over again. I’m interested in these looks & styles of decorating, but weary of everyone basically copying each other. Thank you for going back to color, it’s beautiful! Love the red and green – so cheery. I totally agree with Kay. I am tired of the “all neutral all the time” theme that has taken over blog land. Christmas is a time to celebrate and break free from normal decorating, and you nailed it! I love the traditional red and green done in such a tasteful way. Your home is so festive and welcoming, and of course, beautiful. I love your Christmas decor! I love your Christmas family room. Stunning. Such a wonderful blog. I love everything about it & Thank you very much for sharing your gift. Loving all the rustic farmhouse style and the plaid and red buffalo checks!! Everything is so inviting! I’m definitely into red this year and black and white check with my new gray walls. Love the height of your new tree! It balances the room so well ??? WOW WOW WOW! Its the perfect combination of gorgeous and cozy! 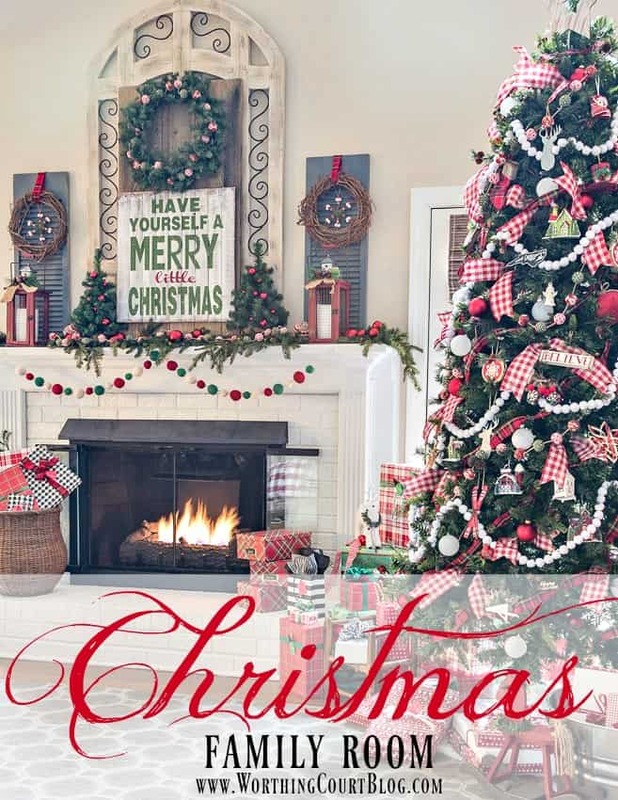 Love your Christmas family room, every inch of it! I really like the traditional red and green with the pop of black. Your tree is so adorable! I keep coming back to it! Your creativity certainly gives me lots of inspiration and ideas. Everything is so beautiful! Where did you get all of the precious ornaments? Like the little “It’s cold outside” pillow and the little list? I love all of those things!!! Suzy, I love everything!! I took red and green out of Christmas over the last few years. Now I’m rethinking!!! You have the sweetest ornaments! I was happy to see you on the tour! Hugs. I love using traditional colors of red and green to decorate with for Christmas. Everything looks great. Thank you for sharing your fabulous family room. Beautiful home! I agree with you on the traditional red and greens for Christmas, it makes me warm and fuzzy inside too! 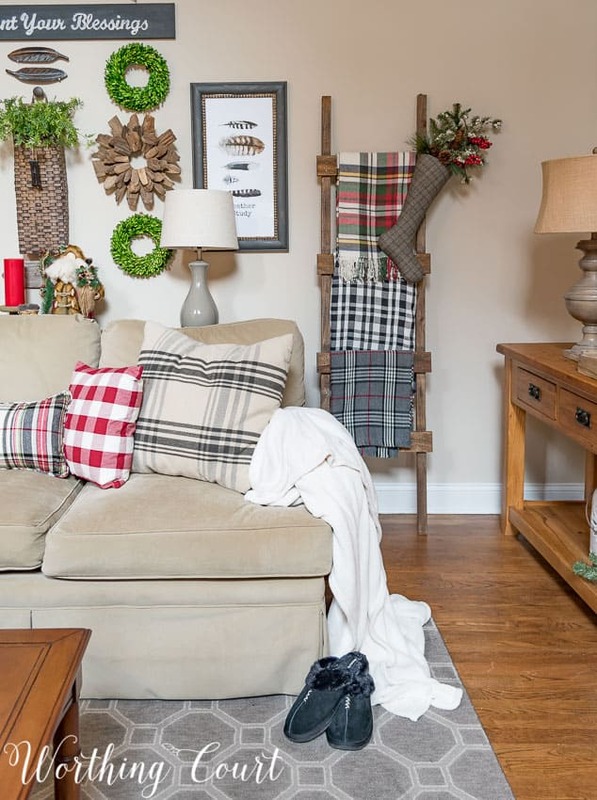 Love all the plaids and unique touches, it’s so fun to see how other people deck their homes for the holidays. Merry Christmas! Oh, Suzy, your home is absolutely gorgeous!! I love everything about it – that mantel! The big tree! It’s all amazing. So happy to have you back fro the HFTH blog tour!! Hugs! Red and Green will always be my favorite Christmas color scheme. Your family room looks gorgeous and I hope you spend many happy hours enjoying it this December with your family. I am all about red during the holidays, too. Your family room looks absolutely beautiful. So festive! Suzy – you never disappoint! Your home is absolutely beautiful! 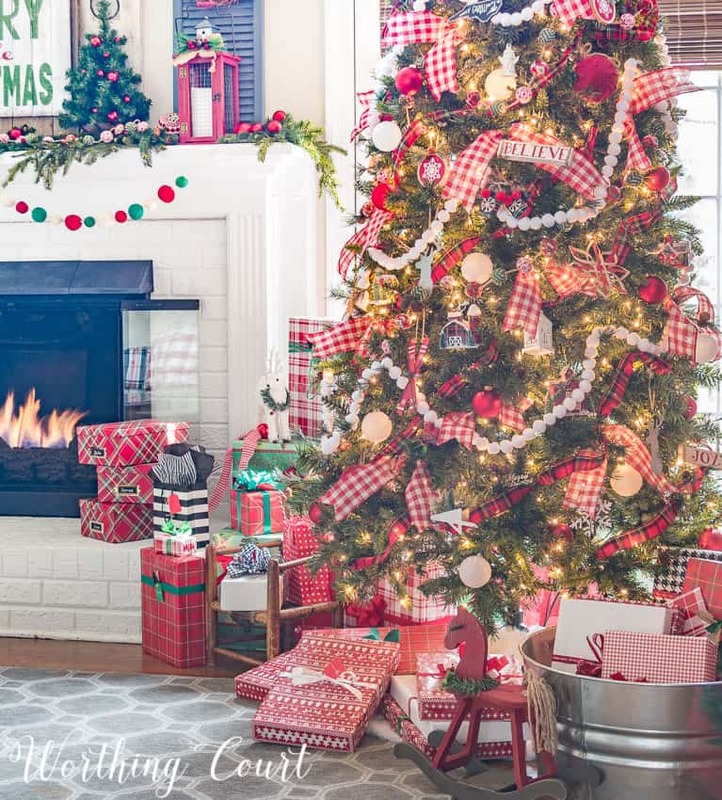 We love your updated traditional Christmas decor…just gorgeous! I usually change my Christmas colors every year but went with red and green this year. I love your use of traditional colors. Your family room is so warm and cozy and perfectly decorated. Thank you for sharing all your ideas. 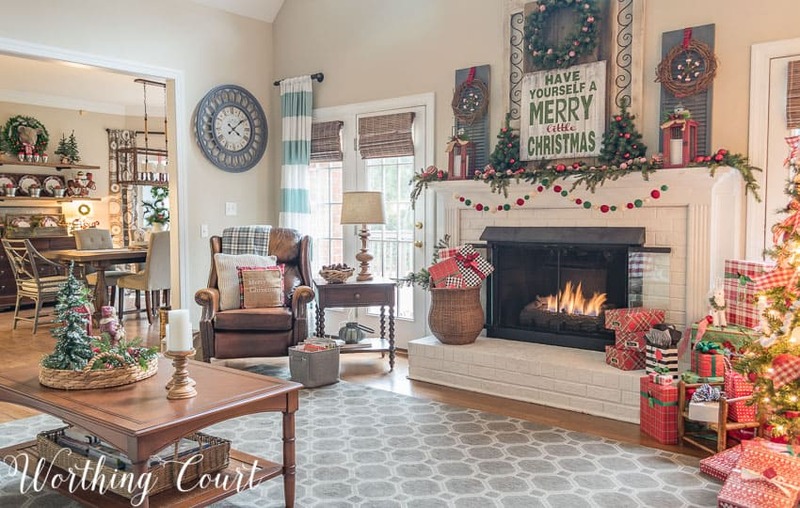 What a beautiful, cheerful and festive family room! It looks like the perfect place to gather around and enjoy Christmas the family! Hi Suzy, I’m a green/red gal when it comes to Christmas as well. And I love all my traditional decorations and I just can’t leave them in my attic. And my family would be so sad if I didn’t bring out the traditional ornaments each year. I enjoyed your house tour! Thanks for sharing. but, you kinda rocked my world when I saw all those wrapped presents! I have so much to do! Wow, now isn’t all that red and green and nostalgia just the cat’s meow!! So warm and inviting. Love it. So beautiful! Love all the pops of red… so festive! Suzy your living room is perfect! I love all the little touches like the basket of gifts, the nordic garland, and the Santa and lantern on your coffee table. You are a superb decorator and really sparkle at Christmas. Wow, loving this home tour, you added such tremendous detail! Your tree is just gorgeous Suzy, loving the ribbns you used too. Beautiful and sooo welcoming. I’m a traditionalist and use red every Christmas, it’s the one time of year that should be bright and festive. I love your tree, especially the use of several types of ribbon and garland. The red gingham tails were a darling touch. Merry Christmas to you and yours. Keep the inspirations coming you are a talented lady! Oh it looks so great! I like the red/green pom pom garland on the mantel! And someone recently suggested I make a white pom pom garland this year out of cotton balls. Is that what yours is made out of on the tree? I had never heard of such a thing, but yours looks so cute I think I may try it out! Hi Heather. My white pompom garland is actually made from white pompoms. I found the garlands at Hobby Lobby. But, what a great idea to make one using cotton balls! Wish I had thought of that! Wow what a stunning room! I love everything about it. I am new to your blog and I love your style. OH I just love all those decorations! So very pretty and festive! Wow, what a beautiful room! Love your tree and your fireplace decor! How cozy! The fire in the fireplace makes this room all the more appealing. Gorgeous. Your room looks so inviting…. Christmas wonderland. Thanks for sharing on Funtastic Friday! Hi! 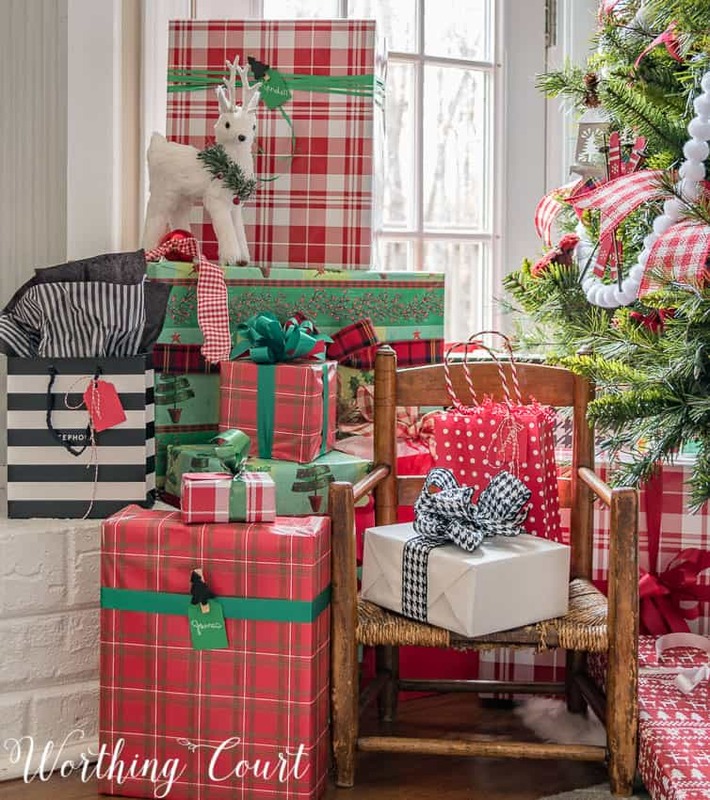 Where is your green garland from on the mantel and where did you find all the plaid wrapping paper? Can’t get enough of your style…My favorite blog by far. This is such a welcoming and festive space! Your tree is gorgeous and I love your mantel decor!